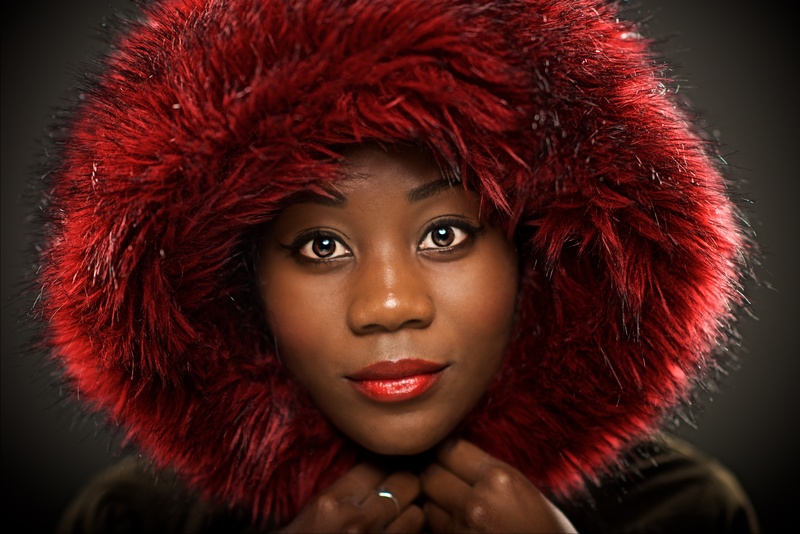 My beautiful model Altine channels her inner Eskimo Nell with this three light studio portrait. Key light is a gridded beauty dish above the camera, with a sunfire reflector below in a clamshell arrangement. Backlights are two gridded 1×4 strip soft boxes at 45º behind the subject. White background not lit. Nikon D810, 85mm f1.4. Very shallow depth of field deliberately applied to blur the furry edges of the hood. This was one of a series of different looks taken on the day, some of which are in the Featured gallery on this site. The picture was later re-titled “Little Red Riding Wolf” for submission to the NCTJ as part of my portfolio, on the advice of my tutor.